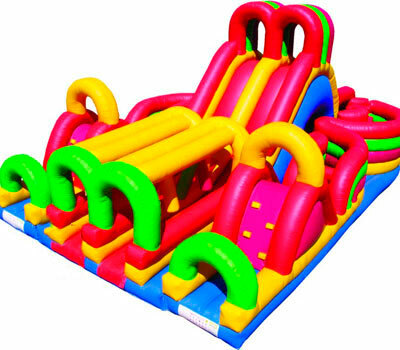 The Adrenaline Maze is a versatile, fun and fast paced inflatable. Two participants race each other up the slide and through the first set of obstacles, crossing over at the centre and progressing through the last set of obstacles and up the ladder. Once up the ladder they go down the slide as quickly as they can avoiding the last sets of obstacles and complete the race. This is a fast paced, high turnover and fun activity. Restrictions: Suitable for ages 4 upwards.